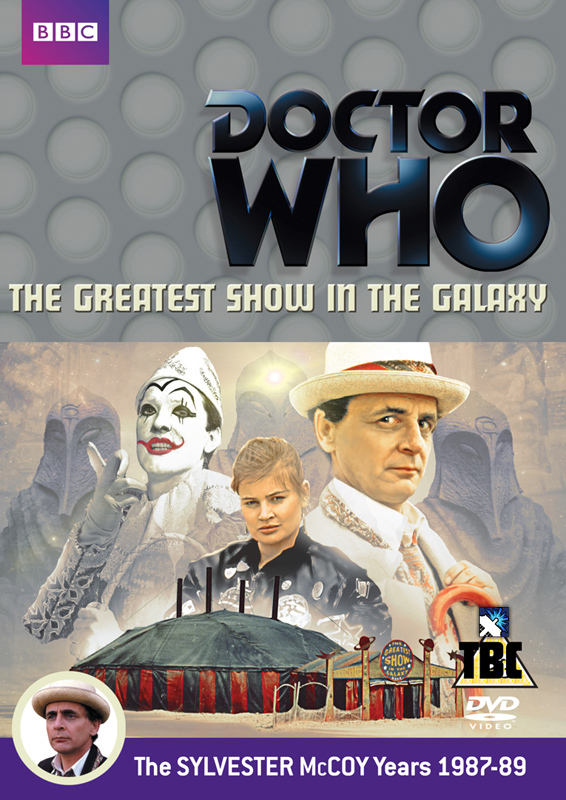 When the TARDIS is invaded by the intergalactic equivalent of junk mail, The Doctor (Sylvester McCoy) and Ace (Sophie Aldred) are drawn to the world of Segonax, and the Psychic Circus. With sinister clowns in hearses, intergalactic explorers and a very strange family who don't ever seem to be entertained, something's not right; and it's down to the Time Lord to set things back on course. Coming towards the end of the Classic series, there's still some rather famous faces doing their star turn (Dame Peggy Mount, for example, and T P McKenna), and popular TV personalities of the time Jessica Martin and Gian Sammarco as Mags and Whizzkid respectively. The story is not great. Most of the series is looking very tired at this stage, and although the main cast do a stellar job with what they're given, it all looks very cheap and lacklustre. The cliffhanger to episode one is non-existant and the other episodes don't fare much better; the story is fairly dismal and seems to drag along - although Sophie Aldred in particular shines as the rebellious teenager who's got a dislike of clowns with a valid reason. The Greatest Show In The Galaxy is a single disc release from the BBC Consumer Products label and as always with the DVD releases, the sound and vision are optimal, and there are a raft of extras on the disc to support thie story. Commentary - This time we've got main cast member Sophie Aldred (Ace) and guest cast Jessica Martin (Mags) and Christopher Guard (Bellboy the eyecandy) along with crew members Stephen Wyatt (writer), Andrew Cartmel (script editor) and musical maestro Mark Ayres. Moderated as always by Toby Hadoke, there's some interesting snippets about the show's limitations and the problems the production went through. The Show Must Go On - The expected behind the scenes documentary on the making of Greatest Show, which sheds a lot of new light on the serial. From the appalling title for the story, via clowns and their sinister aura, the story and the making of the show are deconstructed and examined, and it does let the viewer understand where a great many of the show's problems came from. It's very interesting and fascinating to watch, and the information imparted really does give a very different view of the circus and the drama. There's a lot of love that comes across for the story from the cast and crew alike, and happily their enthusiasm is infectious. Ian Reddington looks like he really needs a decent shower, unfortunately, but the rest of the contributors are top notch. First rate featurette. Deleted And Extended Scenes - From model shots of the TARDIS and the junkbot to Captain Cook driving his little jeep, there's a plethora of things that were edited out of the aired show for timing or editorial reasons. It's about the same as the story though; a little dowdy and down at the heel, and the interest isn't held for too long when the main cast aren't on screen. Lost In The Darkness - A short look at the unused model shots for The Greatest Show in the Galaxy. There's some lovely model shots of the TARDIS spinning away in space, with her lamp gently flashing away. An amazing little sequence that never made it air because it was "too dark". The Psychic Circus - A music video. No, really. A horrible piece of tat made of stuttering visuals from the show, with the vocals provided by the guest cast. Would have suited the mid 1990s era Top of the Pops, in the era of dreadful noise masquerading as music tracks. With inane lyrics such as "There is no escaping us / We are the Psychic Circus! ", the one redeeming factor is it's mercifully short and eminently forgettable. Remembrance "Demo" - More of Mark's Melodies, this time Ayres' demo work for the soundtrack of Remembrance of the Daleks. Whilst it still sounds very clunky and electronic, it's a whole load better than the Greatest Show soundtrack, and this brief set of clips from earlier in the season shows just how good some of the stories really are - to the current release's detriment. Mildly interesting rather than engrossing, and diverting enough because Remebrance of the Daleks was such a good story. Tomorrow's Times: The Seventh Doctor - Anneke Wills hosts this episode of the series looking at the press reaction to the seventh Doctor Who, Sylvester McCoy, and his stories. It's a dark piece, sadly, showing just how badly the show was being received and reviewed by both the press and the fans alike. Anneke is a breath of fresh air and always lovely to watch, and the Points Of View style voiceovers are wonderfully pointed and cliche, to great effect. However the whole piece is painful to watch for the mauling Who receives constantly from the British Press of the age. Victoria Wood Sketch - Jim Broadbent IS The Doctor! The Doctor and Fiona run into old enemy Crayola in this witty and suprisingly accurate Doctor Who sketch from Victoroia Wood As Seen On TV. The effects and the technobabble are spot on for the era, and Broadbent's Doctor has a costume comprising parts of Tom Baker, Peter Davison and Colin Baker's wardrobes. Short but very funny! Coming Soon Trailer - Oh dear, the TARDIS is playing up and the doors open as the Ship lands, reducing the Police Box and it's occupants to around an inch tall. Join the first Doctor, Susan, Barbara and Ian as they make small steps in a very big world, where domestic cats can be lethal and everything looks very, very large... Planet Of Giants is the next DVD release. With the usual audio navigation available, a photo gallery of still from both in front of and behnd the camera, four episodes worth of Info Text to give you factoid and figures onscreen during the main story, and the PDF versions of the Radio Times Listings - and possibly the most boring Easter Egg in history (repeated elsewhere in a major extra, so what was the point? ), The Greatest Show In The Galaxy is very much divided in two as a disc. Whilst the story is somewhat uninspiring, the thought and love behind the show liven up the extras to the degree where your view of the story is almost improved as a result. Almost. It doesn't quite work, but it's certainly a valiant attempt. + Compare Prices for this product on CompareTheDalek.com!